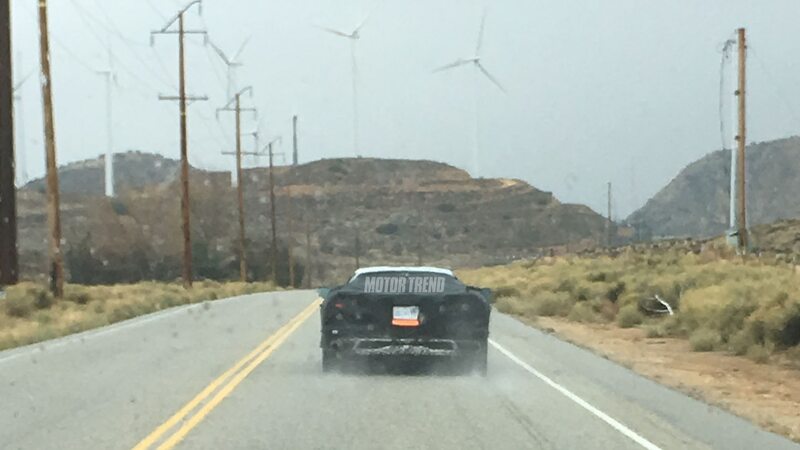 Thanks to "Corvette_Nut" and to MotorTrend, we have some pictures of the ME caught testing in California. It is always a good sign that GM is comfortable testing them 2,000 miles from Detroit. The mid-engine Chevrolet Corvette has been spotted dozens of times over the past two years, but it's almost always caught testing near GM's Milford Proving Grounds in Michigan. It appears the C8 is now starting to venture farther from home, as this prototype caught by our own senior features editor Christian Seabaugh shows. What's perhaps most interesting about this chance encounter is where the mid-engine Corvette was caught: running the same test loop MotorTrend uses for our Car of the Year program. 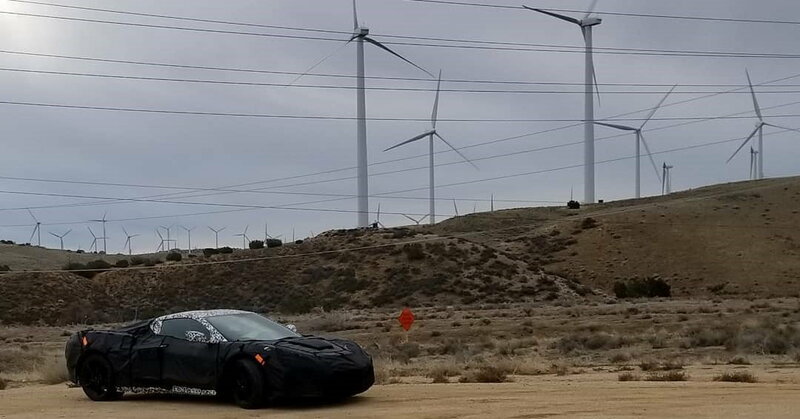 The upcoming Chevy sports car was captured on our Tehachapi test loop near the Hyundai-Kia Proving Ground in California City, California. Automakers routinely test in California's Mojave Desert for its reliably dry, warm climate (though it happened to rain today), but we can't help but wonder if the Corvette team is here practicing for one specific test. Namely, ours. Last edited by John; 02-01-2019, 12:05 AM. Coupe again. Wonder why the heavy camo is back on? We were seeing much more a couple of months ago. Looks really dusty. Air filter testing? Last edited by Bikerjulio; 02-01-2019, 05:14 AM. Yup wet dust as in rain. Does seem strange the cladding is back on. Looking at all of the pictures shows the lack of the heavy cladding. it also shows something that raises a question. Look at this close up image of the bottom of the rear of the car. There is a clear shot of a filter of sorts down there! What is the function of this filter? This is probably my least favorite feature on the entire car. I don't care for this bottom "lip" look. I think that is the exhaust canister, the mesh opening is for dispersing heat. Very similar to many ME I have owned in the past. I have painted the canister matt black on some of my ME cars to hide it. Last edited by Fasttoys; 02-01-2019, 08:53 PM. Possibly heat shielding around the exhaust system? I think that is the exhaust canister, the mesh opening is for dispersing heat. Very simial to many ME I have owned in the past. I have painted the canister matt black on some of my ME cars to hide it. .I have painted my muffler canister on my last two Corvettes with Eastwood’s high temp satin black for that very reason — so it not shiny under certain lighting conditions/views. Atari Prime has used alternative techniques to help this picture we clearer. Thank you. Notice the front wheel’s area. Not sure what I'm supposed to be noticing. same here. I was more struck by the posing of the car on Motor Trend's favorite stretch of road. and the green energy background. wonder what that means? Last edited by Bikerjulio; 02-01-2019, 06:36 PM. Just that we can see the front wheel area in the modified picture but not in the first one. I know grasping at straws while we await real news. Ahhhh the wait continues... ****! Probably GM took those, so it randomly stopped in the middle of the road and someone passed and took a pic. It’s clear that GM is hinting that the C8 will have a windmill to sustain that 48v system. Cmon fellas!